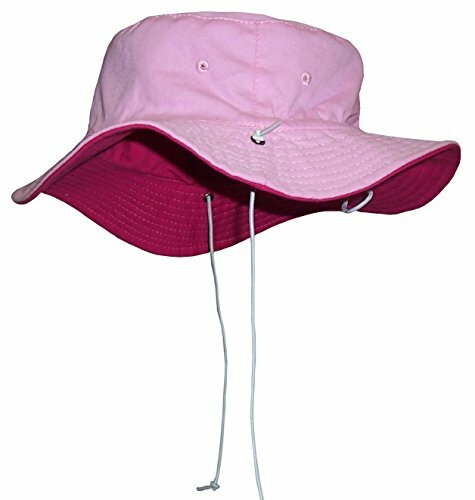 N'ice Caps "Sun Caps" unisex baby reversible cotton twill Aussie style hat with adjustable draw cord in back to allow hat to fit 3 size ranges. Easy to adjust elastic shoe string tie draw cord with lock adjusts up and down to fit 3 size ranges within the recommended age group. Elastic shoe string ties are also adjustable. Great hat for sun protection. Easy to pack. Great reversible colorways. Colors: red/khaki, neon green/neon blue, fuchsia/pink, light blue/white. Sizes: 52cm(20.5 inches) fits 18-36 months. Designed in the USA. Tested and approved as per CPSIA standards.